The 39.78 metre sailing yacht Alithia, jointly listed for sale by Marc Haendle at Ocean Independence and Yachtzoo has been sold to a direct client by Marc Haendle. 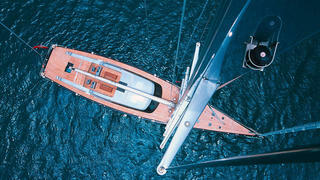 On the technical side, she has a Marten Spars High Modulus carbon fibre 49 metre mast and a carbon fibre boom. Standing rigging is by Nitronic and she is equipped with Reckmann hydraulic furlers. Her wardrobe of Doyle sails was new in June 2013. The third owner recognized the massive potential of this yacht and had refitted her completely during his period of ownership. Under power, a 600hp MTU diesel engine gives her a cruising speed of 10 knots and a range of 2,300 nautical miles. Lying in Palma de Mallorca, Spain, Alithia was asking €8,750,000 with VAT paid.